Kurt Palka was born in Austria, but he has spent some of his life living and working in Canada, and some of that time was spent in Nova Scotia. It was there that he started writing this book made up of ideas that he had gathered and shelved for an inspiring moment. You can read more details of how this book came to be here. At the beginning of the book, it is 1933 and Helen arrives on the French Shore of Nova Scotia, ready to settle down somewhere quiet, with the hope of finally being done with events of the recent past. The story alternates between the present and the past, and it is slowly revealed to us what it is that she is hoping to get away from. Helen was born in France, but moved to England with her daughter during the war. From there, they travel to Montreal where they live for several years before Helen moves to Nova Scotia. While in Montreal, Helen does some travelling with a friend and business partner to buy artefacts to sell to museums. One such trip takes them to northern Alberta where things don’t go as planned. Back in Nova Scotia, the law catches up with her; some new evidence has come to light, and she is put on trial for a second time. What is this new evidence? And what went on up there in Alberta? … what I mean to say is that anything can happen in that court, and it may be fact, but it may not be the truth. This is a book that anyone might enjoy, but a piano or music enthusiast might enjoy it all the more. 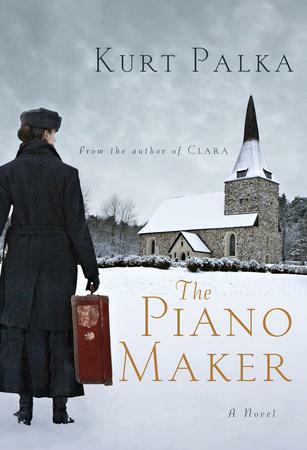 Helen is a piano maker, and the first part of the book is about her family’s piano manufacturing business, and how she came to be a part of it. … never neglect your music… Look after it and it will see you through. For Helen, these wise words spoken by her mother, turn out to be very true. In tough times, she always had her music to help earn her a few dollars, and to give her comfort in times of solitude. I found that The Piano Maker started off slowly and quietly, picking up speed as the story went on. At first the writing style felt stiff, keeping me at a distance, but as the story went on, I was able to relax into it. Or maybe my interest in Helen’s life took over. Whatever the case, I ended up enjoying the read, surprised to find how suspenseful it gets toward the end. This woman lived a very interesting life. Most of the reviews I found on this book were favourable, but a few complain of formal dialogue and flat characters. The biggest discrepancy I found was between the review in The London Free Press calling the book masterfully crafted, and the review in the Globe and Mail which is almost ruthless. I’d love to know what you think! I think it’s the setting which makes this appeal to me. I don’t mind slow narratives. What did you think of the characters? Do you agree that they were flat and you just got used to them because you were interested in them? I always find it interesting when reviewers have such opposing impressions of a book. I liked Palka’s explanation of where his inspiration came from. I had a music teacher once who also tuned pianos, and he was always so intense when he worked on the instruments. I didn’t find the characters so much flat as distant. The way the story is told you feel like you are at a distance, like someone is telling you a story. At first, I didn’t love it, but then I got used to it and was okay with it. I wouldn’t want all my reading to be done that way, though. When professional reviewers have such vastly different views on something as basic as the prose, it makes me wonder if they really know what they’re talking about, or if it is all just personal taste. I expect bloggers’ reviews to be more varied and personal, but not so much professional reviews. My daughter’s piano teacher also tunes our piano, and he gets so into it, lost in his own little world. And I’m always surprised how long it takes and how thorough he is. It sounds intriguing and I like the idea of her being a piano maker – it’s always enjoyable to read about one of these rather unusual skills. Sometimes if the story and characters are interesting enough, it makes up for less than stellar style. That’s how I feel about it, too. I really enjoyed the piano-making part of the book. It’s something I had never read about before. I’m with TJ—always curious when reviews are so disparate (and it seems like more often than not reviews are positive. Or maybe that’s just me.). I like the way you distinguish between flat and distant characters. I love reading books that are set in my home state, and especially when they’re set in my city! How many novels set in Nova Scotia have you read this year? In the past 6 months I’ve read about 5 that take place in Nova Scotia either through the whole book or part of the book. I love it, too! Hey Naomi, I see that G&M reviewer is at it again. See today’s Katherine Govier review. Methinks this person is trying to become notorious as a ‘scathing’ wordsmith. ‘Methinks NOT! Just read the review, and the list of tropes the reviewer describes just makes me want to read the book! I haven’t read her new one yet, but Creation is beautifully written.